In the Ambient/Spacemusic genre there are many kinds of drones. 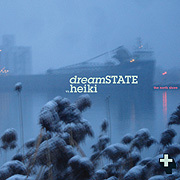 There are the immersion drones of Steve Roach, the glurp drones of Robert Rich, the ironic drones of William Basinski and there are the frostbound drones of The North Shore by dreamSTATE vs Heiki (the duo of Jamie Todd & Scott M2 plus Heiki Sillaste). An ultimate hymn to elsewhere The North Shore presents four tracks which roll with insistent power and compelling restraint. Going deep without ever abandoning the surface this outfit sends sounds and tones across a frigid soundfield the way a cold front moves in a vast open space. The strange unreserved forces of resonating synthesizer outputs slowly covers then penetrate the listener. In blue and gray notes this album seemingly wanders lost from one chord to another. The two most prominent features of The North Shore are its texture, which is slowly ever changing, and its atmosphere, which is overtly frosty. The components making up each drone are complex. Some are layers of several unrelated tones that yield a fascinating undulation of sound, while others possess a most basic purity. This work is difficult to classify based on things already known. It lays bare the impossibility of a universal experience of time. Conjuring an unpeopled landscape, human presence may be felt through the details of the sonic environment. Eerie effects and modulations add density and complexity to this work's meaning, as it is not a product for consumption but a reflection of consciousness.